The day the First World War broke out, Alfie Summerfield's father promised he wouldn't go away to fight-but he broke that promise the following day. Four years later, Alfie doesn't know where his father might be, other than that he's away on a special, secret mission. Then, while shining shoes at King's Cross Station, Alfie unexpectedly sees his father's name on a sheaf of papers belonging to a military doctor. Bewildered and confused, Alfie realizes his father is in a hospital close by-a hospital treating soldiers with shell shock. 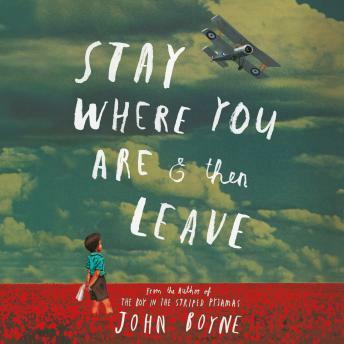 Alfie isn't sure what shell shock is, but he is determined to rescue his father from this strange, unnerving place. . . . in John Boyne's Stay Where You Are and Then Leave.